Is social media a tool in your toolbox, or is it your brand? 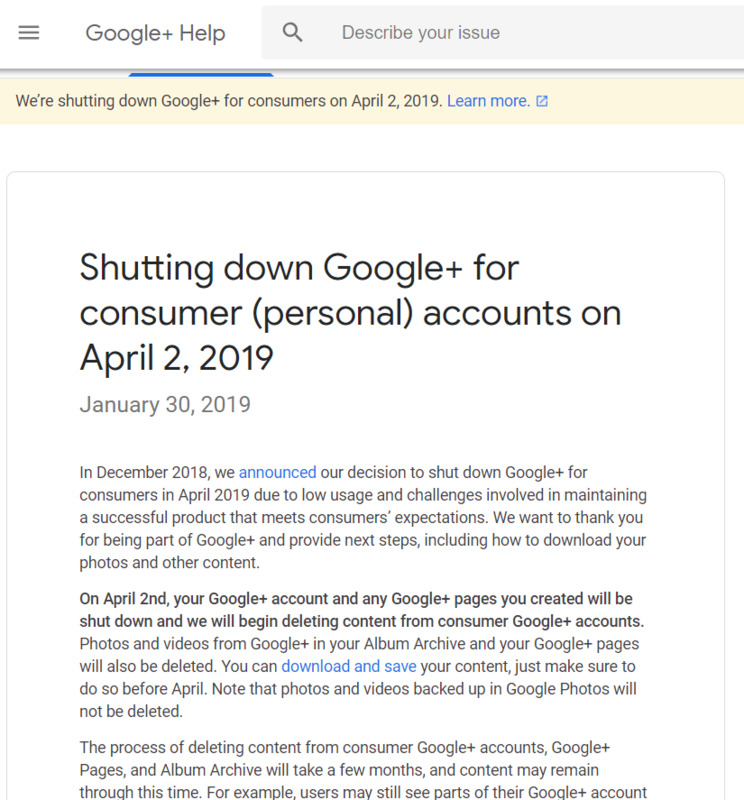 Google+ is being shut down on April 2, 2019. And I know what you’re thinking: What in the hell is Google+ ? All kidding aside, Google launched Google+ in 2011 as a competitor to Facebook and Twitter, and by seamlessly integrating with Google Photos (a la Instagram), Hangouts, and Youtube, there was reason to believe Google could become the online monopoly. Hindsight being 20/20, it’s easy to see this didn’t work out so well for the big G. But at the time, the interface was excellent - so much so that the people who used it loved it. And it had the full backing of Daddy Google. Back in 2011 and 2012, there were tons of articles extolling the benefits of Google+, many of which recommend using G+ as your only online presence. After all, they would write, not only is the platform capable of hosting everything you’re already doing - you get Google’s tech support and priority placement in search results. Imagine your online presence today if you spent a couple-few years building a tribe (including lots and lots of created content), only to have that platform - and all your content - deleted from the internet. Is Facebook going to be around forever? Twitter? Instagram? Pinterest? What about Amazon? Etsy? Any company can change their guidelines, platform, indexing results, bandwidth limitations, or whatever - at anytime. And you won’t get a say in it. What happens if your account gets banned, blocked, or accidentally deleted? What if you want to move your brand to a different platform - newer, younger, better with video or photos, smaller, larger … whatever. Host your own blog, videos, podcasts. And then link out to any social media platform you want. Or all of them! Just don’t build your entire brand around being dependent on them. A monthly e-Newsletter is a great way to stay in front of your sphere of influence without using social media at all - it’s a great way to build your brand without being dependent on the giants. 8DollarFarming offers a full-featured turn-key eNewsletter service at an affordable price - check it out and let me know how I can help..! There are a million articles out there about resolutions, goals, and becoming a better you, so I'm not going to waste your time with a 12-step manifesto on the subject. You can't magically create a dozen new clients out of thin air. But you can create a process of making sales calls every day. And those sales calls will create clients throughout the year. You also can't run a marathon, do 250 push-ups, or lose 30 lbs today. But you can make jogging (or doing some push-ups, or eating a little better) part of your daily routine. The process is what you can actually affect; it's what you have control over - day after day - for the rest of your life. You don't have to think about giant numbers, like making 20 sales calls per day, or running 5 miles at a time. It's better to start small. Very small. Tiny. How many sales calls are you making today? Zero? Then let's start with 1. The action of dialing the phone and making that 1 call is huge, even though 1 is a small number. After a while, when the process has become a normal part of your routine, you can consider increasing the numbers - maybe you make 2 calls on odd-numbered days and 1 call on the even-numbered days. If you get comfortable with this and you still want to increase your business, you can move up to 2 calls everyday, and so on. It's no different for push-ups (try doing 10, or even 5, to start with), running (start out with a mile, or even 1 minute), and eating habits (try adding 1 carrot to your plate at lunch, or even just throwing away the last sip of your sugary soda instead of finishing the can.) You can level-up later once you get comfortable with the new process. Start small, and grow to big over the long-term. Repeating that itsy-bitsy little action over and over again is the difference between winning and losing at your goals. Consistency is what converts that new action into a habit, where it just becomes part of who you are and what you do. It’s also what allows those numbers (and successes) to accumulate and add up to bigger numbers. Doing 100 push-ups today, but then not doing any more over the next 6 months, has the same long-term benefit as doing nothing at all. I’d rather have done a mere 10 push-ups a day during those same 6 months. Consider the action (or process) - and not the end goal. 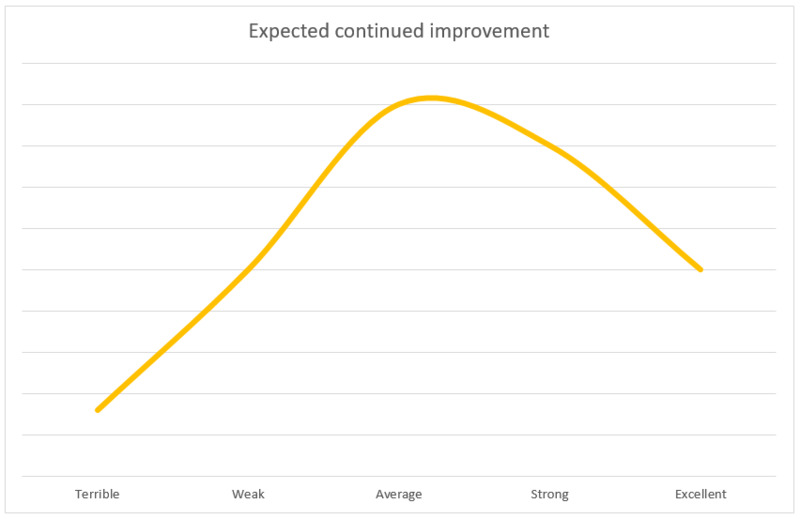 Grow the action (slowly) over time. It doesn’t need to be a “Resolution”, as much as just doing something small to get a little bit better. And then doing it again. Writing and delivering a monthly e-Newsletter is not something that’s easy to start small, as it requires writing and sending the entire newsletter, each and every month. If keeping in touch with your friends and family is part of your business plan for 2019, I’d love to help. Check out 8DollarFarming and give me a shout! There are 2 ways to achieve your “get in shape” goals. 2.) Wage a constant war against yourself throughout the day, pitting pleasure against self-discipline. Elevator, since I already worked out? But the stairs offer more exercise! Full lunch, since I already worked out and I’m really hungry? But the small lunch will help me lose weight! Ice cream on the couch after dinner, since I had a good day (or a stressful day)? Ice cream, really, when I’m trying to get in shape?! The first way will get you most of the way there, and is black & white easy - you either succeeded or you failed, each day. The second way will get you all the way to your goal, and much faster. But it will consume your life. Both options beat doing nothing. The best option is a combination of the two: exercise consistently, and make good choices throughout the day. (Notice I said good choices, not perfect choices.) “In shape” will come, slowly and over time. Work on the processes, the daily habits, the pattern of making good choices consistently - and the shape will follow; it won’t have a choice! There isn’t a right or wrong way to do it - only that you do it. You cannot, under any circumstance, achieve your goals (or even make progress towards your goals) without doing the work. And consistent work over time beats short periods of hard work, every time. And if making good choices all day long is exhausting, and you don’t have the mental energy left over to sit down and write your monthly e-Newsletter, let me do that for you. It’s what I’m really good at, and it’s why I created 8DollarFarming! How Diverse is your Contact List? Diversity makes for a good contact list. Young person buys a first house - a small starter home, or condo, probably on the outskirts of the neighborhood they really want to live in. Young person gets married - the couple decides to sell one of their homes and live in the other one. Family grows - a couple of kids later and the house is too small; the family needs to sell the starter home and buy a larger, more family-friendly house. Pause - for many people, this will be the last house they need for a long time, as their focus turns towards raising their family. So, from early 20s to mid 30s it's not uncommon for a person/couple to buy 2, 3, or even 4 houses. But then they might have a period of 15-20 years without needing any real estate help. There becomes a trade-off, where younger people may buy and sell homes more frequently, but older people (let’s call them more mature, or more established people) may buy and sell more expensive homes. And if you need help staying in touch with the large, diverse group of people you know, please consider my e-Newsletter service - I would be happy to help! Outsourcing makes your business, and/or your quality of life, better. Make More Money: Getting bogged down in the nitty-gritty paperwork takes your focus, and your time, away from your marketing efforts. You can make more money (consistently, without ebbs and flows) if you pay someone else to push digital paper. Avoid Potential Problems: You aren’t good at filing paperwork, and your lack of details might end up costing you a lot of money in fines, lawsuits, and/or E & O exposure. You can save yourself a potential financial nightmare by spending a little bit of money on each transaction - much like an insurance policy for your business’s long-term well being. Increase Quality of Life: You’re busy, and you don’t really enjoy this part of the business. You’d rather work 40 hours per week and enjoy yourself than 50 hours per week and complain about all the stupid rules your broker has for each document in each transaction. Outsourcing has been around for centuries; it’s the basis of the entire service industry. (More than that - it’s the basis of the entire free market; otherwise we would all have to be completely self-sufficient - and who wants that?) You can pay someone to do just about anything for you: cooking, cleaning, child care, home maintenance and repair, etc. - the list is infinite. On the flip side, however, is spending money. You’re welcome to pay all these people for all these services, which will free up loads of time. But you better use that time to make a lot of money, because outsourcing these services isn’t free! Bottom Line - Pick your spots. Outsource the work that can help you make more money, or more consistent money. Outsource the things you aren’t very good at, or the things you simply hate doing. We all have a goal which at some level is about increasing our quality of life - short-term, long-term, now or in retirement, family time, work-life balance… Whatever. If outsourcing helps you get there, do it! Ps - Here’s my shameless plug for 8DollarFarming. If you want to outsource your monthly eNewsletters, and have someone else write and email them to all your contacts, every month, on your behalf.. Well, I’m pretty good at that.